Andy and I were on a date the other day and happened to walk through a strip mall parking lot. Three young skateboarders hang out lazily in an empty section of the parking lot, goofing off but mostly just sitting around talking on their cell phones. Suddenly, Mall Cop #1 rolls up in his electric golf cart and starts saying something to the supposed "leader" of the teeny-boppers. The leader was on the phone at the time and did not know he was being summoned. This obviously threatened Mall Cop #1's ego, he proceeded to hop out of the golf cart and yelled at the Leader. Leader lazily turned around as his two friends just watched the whole thing unfold. They all just stood there as Mall Cop #1 rattled/yelled off the rules of conduct for the parking lot. Mall Cop #1 must have made a call in for back up sometime during all of this because within a minute or so, Mall Cop #2 rolls up in his golf cart and screeches his tires to a halt (that was the funniest part of the whole scene, wish you could have been there) and hastily jumps out to assist with the problem. Teeny-boppers are now surrounded by golf carts and mall cops. As we walk by we watch Mall Cop #1 regain authority by jetting his finger in the direction of the exit as he tells the Motley Crew to "get out and stay out!" We don't really know what happened next but I am imagining a good laugh and more goofing off as the skateboarders lazily pick up their stuff and leave the premise. 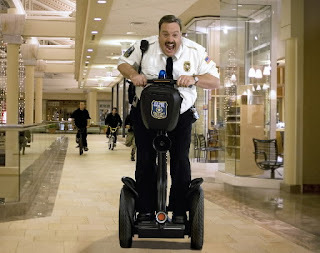 I'm sure friends at school are laughing it up and reciting lines from the new Mall Cop movie that has just come out. I am also imagining Mall Cop #1 and #2 watching with eagle eyes to make sure the boys leave the property and then discuss their thoughts of the "hoodlum skateboarders". I imagine the rest of the mall cops heard the story too, with fire in their eyes and a hunger for more skateboarders to threaten the security of the strip mall. I now have first-hand account of why Paul Blart is so famous. These guys are for real. hahahah, that was a good needed laugh today. have had a screamer today. :( thanks!